DETROIT – The 20-person field for the men’s competition at the 2019 U.S. Figure Skating Championships included three Olympians. Those three Olympians are also the only three of 20 to have landed on a past U.S. championships podium. And it is those three who again landed in the top three following Saturday’s short program of the Team USA Champions Series, presented by Xfinity. Nathan Chen, a 2018 Olympian and the two-time defending national champion, Jason Brown, a 2014 Olympian and 2015 U.S. champion, and Vincent Zhou, 2018 Olympian and two-time U.S. medalist, are first through third – and they set themselves apart from the rest of the field. 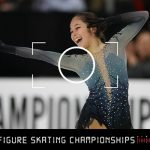 Chen scored 113.42 in the short, which marks the highest U.S. championships score in history and Chen’s personal best. Brown scored a 100.52 for his first mark over 100 in the new scoring system, and Zhou is close behind with a 100.25, more than 22 points higher than his international best under the scoring system. The fourth-place finisher is more than 16 points behind Zhou.